The Nebraska Parenting Act requires any parent involved in a court case regarding child custody, such as a divorce, legal separation, paternity action, or modification of custody action, to create a parenting plan for the court’s approval. A parenting plan is an agreement or court order that sets forth both parents’ rights and responsibilities regarding their minor children, including custody and parenting time arrangements. If the parties are unable to develop a parenting plan on their own or with the help of their attorneys, the parties will be required to attend mediation. Mediation is a process in which a neutral third party, who is trained specifically in parenting plans, will assist parents in discussing and reaching agreements regarding the custody and care of their children. 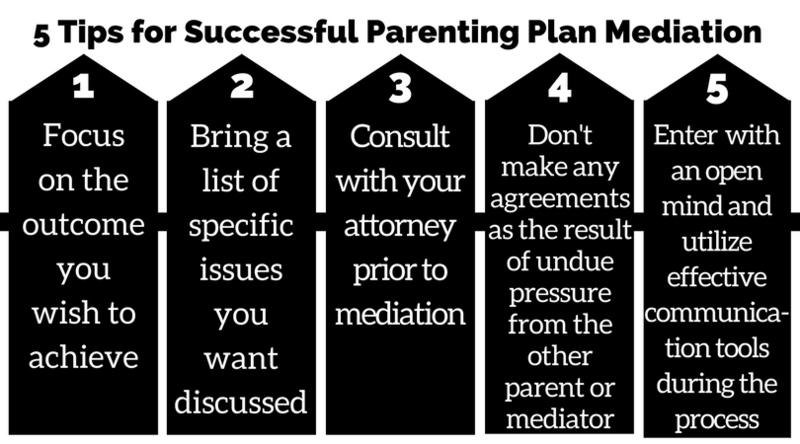 Mediation can be a successful tool for parents to reach agreements outside of court. Here are 5 tips for parents to maximize the success of the mediation process. Focus on the outcome you wish to achieve. Set your intentions prior to the mediation session. The more clear you are about what you want to achieve in mediation, the better you will be able to convey your thoughts and wishes to the other parent. For example, your intention for mediation could be to restore communication with the other parent or to assure that no matter what outcome is reached, the best interests of your children are protected. Bring a list of specific issues you want discussed. While it is not necessary for you to have made a decision regarding your position on every issue to be discussed, it is useful for you to identify them prior to mediation. Consult with your attorney prior to your mediation session. If you are uncertain about your legal rights as it relates to any topic in mediation, contact your attorney in advance to discuss these issues. For example, you may want to discuss with your attorney the impact of equal parenting time on child support. Don’t make any agreements as the result of undue pressure from the other parent or the mediator. While compromise is an essential element in mediation, do not feel pressured to agree to a certain provision if you strongly oppose it. If you notice yourself feeling pressured to accept an agreement or provision that makes you uncomfortable, ask for a break or recess of the mediation to another date. If you found yourself agreeing to a provision during mediation, which you now strongly oppose, talk to your attorney. He or she will have a period of time to review the parenting plan and object to provisions which you now don’t agree with. Enter mediation with an open mind and utilize effective communication tools during the process. Allow space in the mediation process for the other parent to express their desire and concerns. Speak only for yourself by using “I” statements and not “you” statements. Be respectful and do not interrupt the other parent. Avoid language that only serves to blame or criticize the other parent. Mediation can be a powerful tool for parents to reach fundamental agreements regarding the raising and parenting of their children after separation. Keep these tips in mind to ensure that you have the best possible mediation experience which hopefully will result in complete parenting plan for you and the other parent to follow.